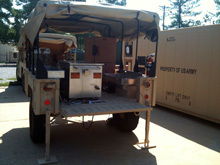 The Army Assault Kitchen (AK) is a highly mobile field-feeding platform that effectively meets the nutritional requirements of forward deployed troops while reducing the field feeding logistical footprint. It is based on and utilizes the same key components as the Marine Corps Tray Ration Heating System (TRHS), which has been in use since 1996. Assault Kitchen's (AKs) are being fielded by the Army as a replacement for the Kitchen, Company Level Field Feeding (KCLFF). The AK Tray Ration Heater (TRH) provides a heat-on-the-move capability that enables a company-sized group of Warfighters to be nutritionally supported within minutes of AK arrival at a remote feeding site. assembly, a fuel supply system, insulated food and beverage containers, an ice chest, serving tables, utensils, a maintenance kit, and other ancillary equipment that supports the remote feeding of UGR-H&S meals. When mobility is not required, AK components can be removed from the HMMWV and LTT and employed in a static position. The Tray Ration Heater (TRH) used in the Assault Kitchen and Tray Ration Heating System is the only DOD approved heat on the move, field feeding appliance. Adopted by the U.S. Marine Corps in 1995, the system revolutionized military field feeding by virtually eliminating long tail subsistence logistics. The TRH was designed specifically to take advantage of the tray pack ration. Officially known as the Unitized Group Ration Heat & Serve (UGR H&S), tray packs are shelf stable, fully cooked meal components. Each tray pack contains either 9 or 18 portions of entrée, starch, vegetable or dessert item. Additional vegetable items are packaged in standard, commercial #10 cans. The Tray Ration Heater can hold up to 24 Tray Packs or any combination of tray packs and #10 cans. Once loaded with rations, the tray ration heater is then filled with water to cover the tray packs. Once powered up, the tray ration heater’s on board Airtronic Burner heats the water to approximately 190 degrees. This is accomplished while the tray ration heater is being transported to the designated feeding site. After 45 minutes of immersion at temperature, the rations are ready to be served. In this manner, a single TRHS feeds up to 250 persons within minutes of arrival at the feeding location. Additional personnel can be fed by reloading the TRH and repeating the process. As long as the water in the TRH remains clean, the same water can be utilized for an indefinite number of heating cycles. The Assault Kitchen, like the Tray Ration Heating system before it, is the most energy, water and manpower efficient feeding system ever deployed by the U.S. Military. The entire system is designed to mount into a Light Tactical Trailer, towed by a military HUMVEE. Unitized Group Ration Heating Requirements. UGR Heat & Serve ration packs, commonly referred to as tray packs, are available in a variety of menu selections. Most items are packaged in either 9 or 18 portions per package. The required heating time is unique to each type of menu item and is dictated by the specific density of the packaged product. Heating times for specific products are printed on the tray pack packaging. In general, most UGR H&S products require immersion in simmering water of 40 – 45 minutes. Denser products, such as mashed potatoes or refried beans, may require simmering for as long as one hour. Boiling UGR H&S packages is not recommended as it may create internal tray pack over-pressures, leading to scalding of personnel assigned to open such a pressurized tray pack. The Tray Ration Heater has the capacity to heat up to 24 UGR Heat and Serve tray packs, or a combination of tray packs and number 10 cans to a serving temperature of 160°F + 10°F, -0°F in the AUTO MODE in one hour or less. This timeframe assumes a starting water temperature of 190°F or greater, as directed by the tray pack heating instructions. Heating Commercial Boil-in-bag Rations. The Tray Ration Heater has an optional perforated, food grade, stainless steel liner, which may be added to the AK accessory set. This liner shields the hot surfaces of the ration heater tub’s bottom and exhaust-end wall, thereby preventing contact with, and potential melting of polyvinyl packaging materials. The Tray Ration Heater, with liner, can cook or reheat commercial boil-in-bag products in a manner consistent with the food manufacturer’s recommendations. These recommendations, while specific to each product, is generally to immerse at gentle simmering temperatures consistent with the water temperatures delivered in the AUTO MODE. The Tray Ration Heater is capable of preparing a variety of A-Ration foods when used with available accessory items such as the Steamer Basket and Egg Pan. The Steamer Basket is a set of two perforated, food grade stainless steel baskets designed to sit atop the removable tray pack rack assembly, and just above the water bath. With the lid closed and the system in BOIL MODE, low pressure steam is generated inside the tray ration heater. Raw food items, such as fresh vegetables and seafood can be prepared in the traditional steaming manner consistent with the instructions dictated by the Armed Forces Recipe Service. Caution must be exercised when preparing A-Rations in this manner. Personnel must wait until internal steam pressures are completely vented PRIOR to opening the Tray Ration Heater lid. The Egg Pan is a food grade stainless steel pan designed to sit atop the tray pack rack while maintaining slight contact with the surface of the water bath. The heat from the water in AUTO Mode is sufficient to heat the pan to a degree enabling the scrambling of bulk quantities of various egg products. Egg products prepared in this manner are done so with the Tray Ration Heater lid in the open position. The Egg Pan can also be used in a closed Tray Ration Heater in BOIL MODE, for the steaming of rice. Steamed rice can be prepared in a manner consistent with the instructions dictated by the Armed Forces Recipe Service. Caution must be exercised when preparing rice in this manner. Personnel must wait until internal steam pressures are completely vented PRIOR to opening the Tray Ration Heater lid. Temperature Settings. The Tray Ration Heater has two temperature settings; a boil mode that allows the unit to heat the tank of water to a gentle rolling boil, and an auto setting that allows the unit to heat the tank of water to 190°F + 10°F in one-half hour or less. Burner System. The Tray Ration Heater comes with an Airtronic burner with the capacity to heat the rations specified above. The burner is securely attached to one end of the tank and is capable of being quickly and easily removed for maintenance or replacement. The Airtronic burner meets Underwriter Laboratories (UL) Standard No. 296. Fuel Utilization and Consumption. The Airtronic burner is self-priming and operates on the complete family of distillate fuels. These include, but are not limited to, DF1, DF2, arctic, and JP8 diesel fuels. The Airtronic burner has a variable firing of .2 gph – .6 gph. Adjusting the firing rate is accomplished with a single screw-type mechanism. No parts changes are required. The high efficiency heat exchanger in the improved Tray Ration Heater, allows a medium burner setting (about .40 gph) to satisfy all previously cited time and heating requirements. The high insulating value of the improved Tray Ration Heater is capable of limiting water temperature heat loss, with the lid closed, to a rate of one degree per hour. This high thermal efficiency allows the burner to fire less frequently, improving overall system fuel efficiency even more. Voltage and Current. The Tray Ration Heater operates on 120 VAC, 50/60Hz, with a maximum current draw of about 150 watts. Safety. The Tray Ration Heater is safe to operate. It contains a number of safety features built into the total design. Low Water Level. A sensor is located in the tray ration heater tub to ensure the burner will not start without sufficient water in the tank, and that the tray ration heater will shut down the burner if the water level in the tank falls below the sensing unit. Electrical Overload Protection. Necessary overload protection is incorporated to protect against component damage, electrical shorts, and personnel burns. The overload protection is readily accessible for resetting, removal, or replacement. Tilt Switch. The Tray Ration Heater contains an integral switch that will shut off the burner if the unit is tilted more than 30 degrees from horizontal in any direction. External Temperature. The temperature on the outer housing, controls, handles, latches, and top does not exceed 120°F when the unit is operating, except at the steam vent outlet and exhaust tube area. Noise. The Tray Ration Heater does not produce noise in excess of 78 dba when operating. Weight. The dry weight of the empty Tray Ration Heater does not exceed 310 pounds. Materials. The heating tank, tank lid, electrical control box, and removable ration rack and liner are all made from corrosion resistant stainless steel. Materials used meet food contact surface requirements for inside the tank and lid, as specified in NSF International Standard No. 51, See Chapter 4, section VI, TB MED 530. All outside surfaces of the Tray Ration Heater are easily cleanable. Tray Ration Heater Tank. The Tray Ration Heater tank is fabricated of heavier stainless steel (14 ga. vs 16 ga.). This makes the unit more resistant to denting and rough usage. It also allows the top surface of the water tub to be extremely flat and smooth, achieving a better appearance and improved lid sealing. The tub is manufactured with rounded inside corners and is constructed to NSF International Standard No.4. The improved drain valve, terminating in a standard garden hose adapter, is now a free flowing assembly with a sweep elbow. This improvement increases the drainage flow area and makes cleaning the tub easier. The current TRH is 1.5” taller than the original. This extra height allows room for the removable tray pack rack to sit on top of the new perforated liner assembly, eliminating the need to remove the perforated bottom and rear wall assembly, except for cleaning. Tray Ration Heater Lid. The current Tray Ration Heater lid comes with a larger handle to make lifting easier. It also serves as a convenient assist handle for users getting in and out of the HMMWV cargo area. Additional improvements to the lid include a new lid stop configuration and improved hold down lid latches with molded plastic grips that will not come off. An FDA approved, silicone rubber gasket, in conjunction with a better retaining flange and the new flat tub surface prevents unwanted water and steam leakage. The lid also has a non-mechanical steam vent to prevent high-pressure build-up during operation. This minimizes the inherent safety hazards associated with opening the lid of any hot water vessel. Tray Ration Heater Firebox. The improved TRH features a hastalloy firebox in place of the original alumina silica refractory firebox. This increases the life of the TRH and provides better tolerance to the extreme vibrations experienced in off-road use. A more precise entry cone and protruding lip sealing allows the user to install and remove the Airtronic burner as simply as opening or closing a drawer. Electrical Wiring. Electrical wiring in the improved Tray Ration heater conforms to the requirements of UL Standard No. 62, and is arranged, supported, and marked to allow identification with the wiring diagram. Maintainability and Repairability. Routine maintenance and repair of the improved Tray Ration Heater requires only standard hand tools. All electrical and control elements are conveniently located to offer ease of accessibility. Caution Labels. A caution label containing the words “CAUTION- MAY BE HOT” is securely attached to a readily visible location exhaust end of the Tray Ration Heater. An additional warning label cautions against the use of gasoline as a fuel and is visible at the burner end of the unit. A label advising a “four man lift” requirement is under development. Operating Instruction Plate. A corrosion-resistant, permanent data plate containing complete operating instructions for the tray ration heater is under development. Welding. All welding performed in the manufacture of the Tray Ration Heater is in accordance with the requirements of AWS Standard No. D1.6. Environmental requirements. The Tray Ration Heater meets the requirements specified in 3.3.1 through 3.3.5. Operating temperatures. The tray ration heater is operable and functional at ambient temperatures of –50°F to + 120°F. Altitude. The tray ration heater is operable at altitudes up to 8,000 feet above sea level with proper air mixture adjustment. Rain. The tray ration heater is operable after being exposed to rain. Corrosion. The tray ration heater is made of high grade stainless steel. As such, it should suffer no penetrating corrosion, deterioration, clogging or binding of moving parts, or change in tolerance limits on any internal or external parts when exposed to a corrosive environment. Vibration. The tray ration heater will remain operable after being subjected to vibration. Interface and interoperability capabilities. The tray ration heater meets the capabilities specified in 3.4.1 through 3.4.5. Vehicle and Fuel Supply Interface. The tray ration heater is designed to interface with the High-Mobility, Multi-purpose Wheeled Vehicle (HMMWV). The tray ration heater will run off a five gallon fuel can (NSN 7240-01-337-5269), and fuel feed hose adapter (NSN 7240-21-911-8834), and can be secured to the cargo bed in a manner that will permit installation and removal without tools. Fuel Line. A fuel line hose with drip resistant quick disconnects at both ends is designed to be attached between the fuel can and the tray ration heater. The fuel can adapter is permanently vented so that the fuel pump in the burner will be properly draw fuel from the fuel can. The supply side line contains a transparent, plastic, vehicle type, in-line fuel filter that can be easily replaced using a flat tip screwdriver. The length of the fuel line is 12.5 feet long, allowing placement of the fuel can at a safe distance from food or hot surfaces. Skids, and Skid Rings. The bottom of the tray ration heater is supported by two skids with curved ends, and rings at each lower corner of the skid to accommodate tie down straps for securing the unit during transit. The skids are designed and placed to interface with the grooves on the cargo bed of the HMMWV or the LTT. Removable Tray Pack Rack. The removable tray pack rack is furnished with each ration-heating unit, and is designed to accommodate 24 tray packs. Power Cord. The tray ration heater is equipped with a fuel and water resistant, 16 gauge, 3-wire, 12-foot long power cord. The cord is capable of supplying sufficient power to operate the tray ration heater and conforms to UL Standard No. 62; and flame resistance requirements of MSHA, Title 30, Part 18, Section 18.64, Part 7, and Subpart K, Section 7.407. The Marine Corps TRH uses a female bulkhead Amphenol power connector and a male Amphenol power cord. The Army AK TRH utilizes a male bulkhead Amphenol power connector and a female Amphenol power cord. Other differences lie in the collateral set configurations and mounting assemblies. As Babington Technology does not provide the complete AK, we are unable to document the AK collateral system at this time. We hope to be able to provide this service at a future date. The Marine Corps Tray Ration Header (TRH) uses a female bulkhead Amphenol power connector and a male Amphenol power cord. The Army AKs Tray Ration Header (TRH) utilizes a male bulkhead Amphenol power connector and a female Amphenol power cord. Other differences lie in the collateral set configurations and mounting assemblies. As Babington Technology does not provide the complete AK, we are unable to document the AK collateral system at this time. We hope to be able to provide this service at a future date.